With demand for minerals increasing, the mining industry is facing a serious question - how to produce the metals society needs in a way that is economically and environmentally sustainable for the future? Professor Frank Shi is leading a team from the Julius Kruttschitt Mineral Research Centre (JKMRC) to tackle this issue. The team are approaching this challenge with what Professor Shi calls a ‘disruptive technology’ for the industry – high voltage pulse. High voltage pulse (HVP) technology has been left on the backbench for decades. “In the 1950s Russians attempted to decompose water into hydrogen and oxygen. In the 1970s it was used in a mining context to liberate valuable minerals from ore, at a high energy cost,” said Professor Shi. Many years later and the team at JKMRC are using this technology in a different way. Instead of using HVP as a comminution tool, they use low HVP energy to selectively break the ore and change ore processability, allowing for better performance of downstream processes and savings in energy. “We found that the high voltage pulse can find whether a particle contains valuable minerals or not. Similar to how a golf club will attract lightning in a storm, high voltage pulse has a selective breakage mechanism where the ore containing high conductivity/permittivity minerals is broken while the barren rock is not," said Professor Shi. Professor Frank Shi standing with SMI-JKMRC’s SELFRAG HVP Unit. 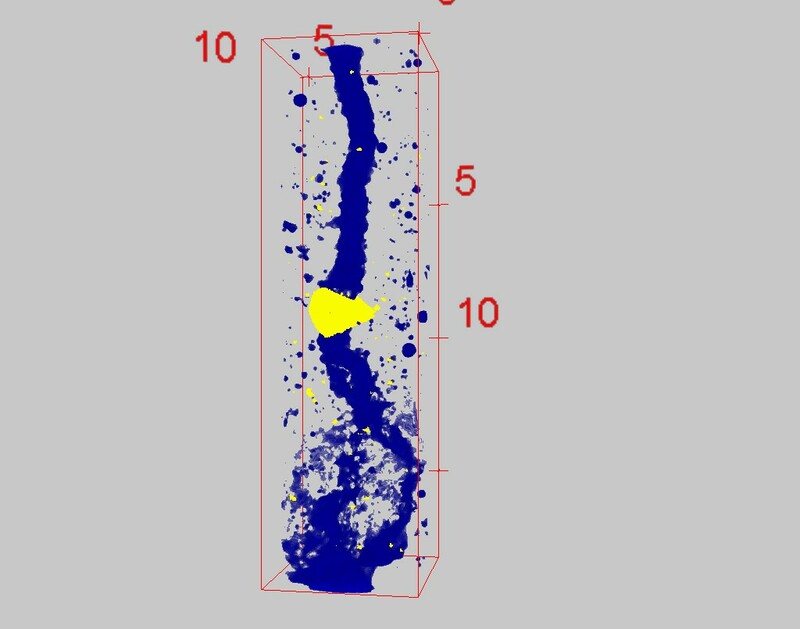 The X-ray computed tomography (XCT) image shows a chalcopyrite mineral grain (in yellow) induced HVP breakdown channels (in blue) in a synthetic rock (in grey), scale in mm. 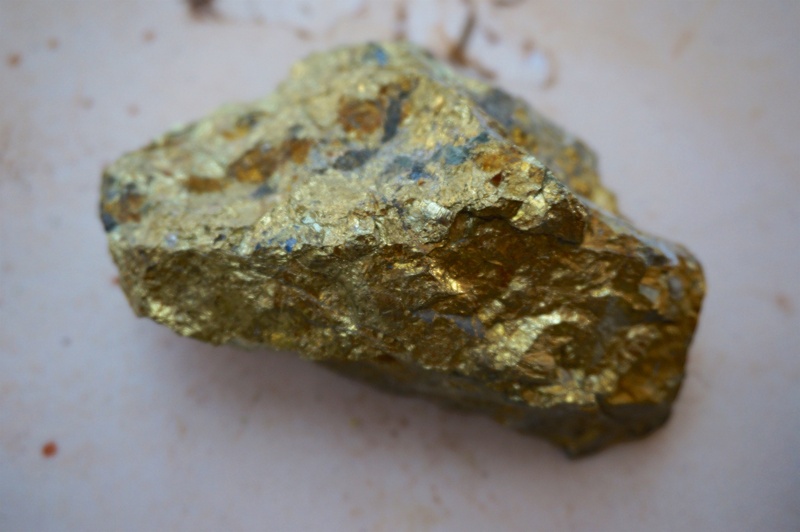 In the lab, the team submerged two small synthetic rocks into the water of the HVP processing vessel – one barren and one containing chalcopyrite. Operating parameters such as electrical voltage, current, capacitance, resistance, inductance, pulse frequency, and electrode configurations were controlled to optimise the system. When the machine started, a bang was heard as 180 kilovolts were discharged into the rocks for one pulse. One rock remained intact, but the other was fragmented and could easily be further broken by hand. 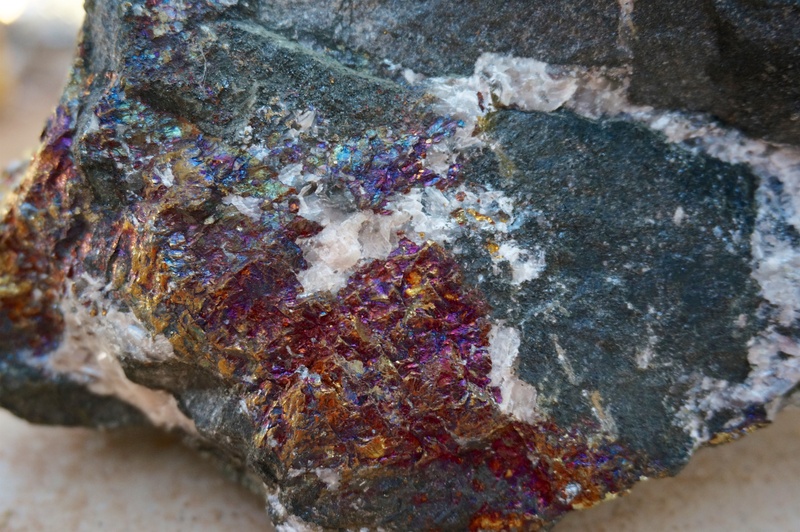 This meant the broken rock contained valuable mineral, and shiny metal could clearly be seen on the newly exposed surface. Fragments could fall through the holes in a screen, while the barren rock could not, allowing it to be screened out. Professor Shi estimates for a 20 million tonne per annum operation, rejecting 30% of barren rocks would result in a $14 million per annum saving in haulage costs, and also bring significant benefits with respect to water use and tailing treatment. The project is also looking at ways to reduce grinding energy consumption, which is the heart of mineral and metal extraction. 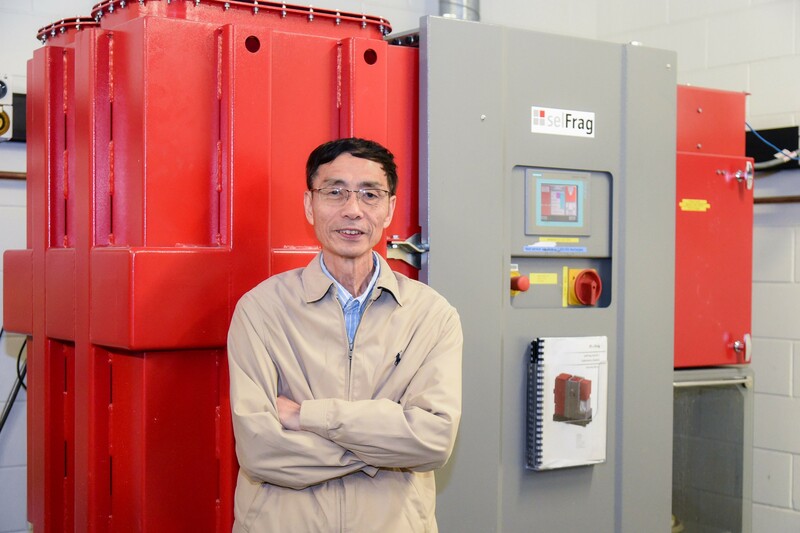 “Grinding is the single largest energy consuming process in any mineral processing plant, which is a constraint in the processing of low grade ores, and a significant barrier in the near future when even lower grade ores are treated,” Professor Shi said. Ultimately, high voltage pulse will increase mining operation profitability. The research team are working on the project with the Huazhong University of Science and Technology in China and they have secured sponsorship from Newcrest Mining Ltd, Newmont Mining, and from UQ strategic funding. They are still seeking additional sponsors. In 2018, the team initiated a new collaborative research project focused on bridging the gap between lab-scale research and industrial-level operation and submitted patents for innovative equipment developed to achieve this goal. Newcrest and UQ co-funded a new flexible HVP testing facility at JKMRC to house this equipment.